Today it was a little windy offshore so we decided to stay relatively close and look for a king mackerel until the wind died out. 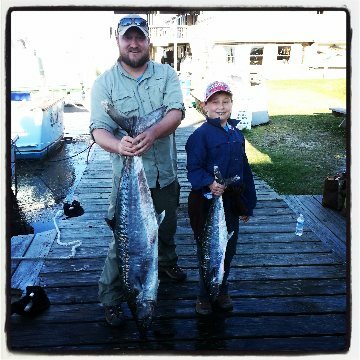 We thought we were in the meat when the first bait in the water was skyed on by a giant 45lbs King Mackerel. We caught him and had a few other bites in that area but didn't manage to hold on to any more. We proceeded to look far a wide for some more bites and found some great looking condidtions but only managed to catch one other king and a few alberts. The wind didn't fall out until late so we never made it offshore but for the sound of the few boats that did the fishing wasn't much better out there. My group had a great time inspite of the slow fishing.